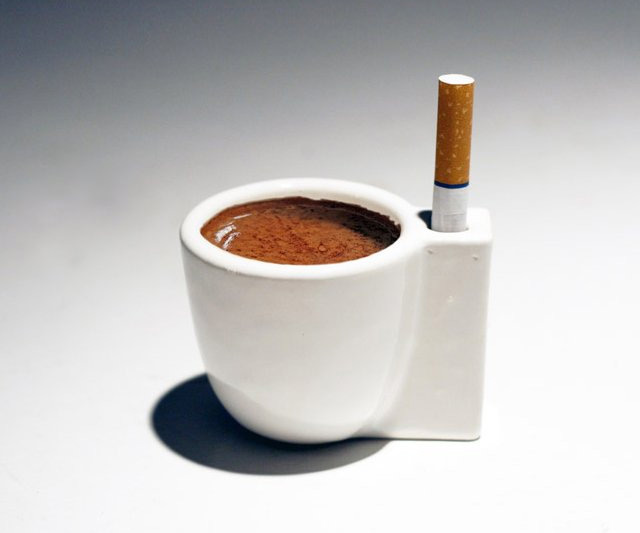 The effects of the weekend call for a thick shot of Death Wish Coffee and a long drag of a Marlboro Light. It's almost like Solo e Sola knows that my Saturday night culminated in the crushing of a raw egg in my right hand* such that it exploded all over the very nice kitchen and dining area of a hostess who probably would prefer not to be stuck scrubbing yolk out of the crevices in her walls, drawers, and carpet for the next two months. 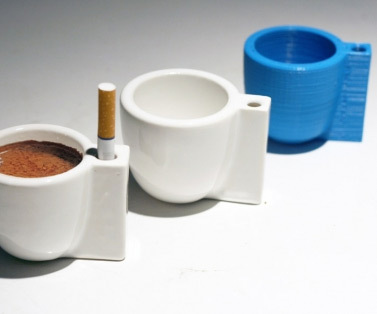 It's almost like this espresso cup with a single cigarette holder built into its handle was made for people like me on days like this. Admittedly, the Solo e Sola does not promote the healthiest of habits as advertised, but if you replace the cigarette with a joint, it would morph from jacked up and cancer-causing to jacked up and surprisingly, pleasantly mellow. The latter of which is also a most excellent, dichotomous display of vices, further elevating the cup's status as both utilitarian and profound. I crown it the King of Ceramic Drinking Vessels. 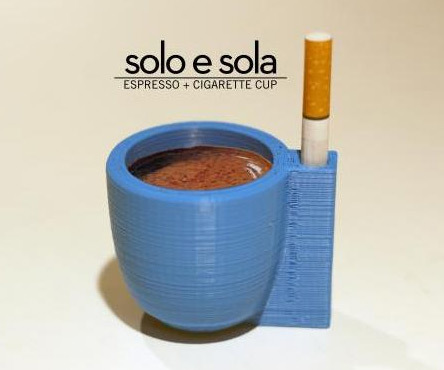 Solo e Sola espresso & cigarette cups are sold individually for kind of a lot of money and measure 2.9" wide x 2.3" high x 2.3" in diameter. *Fact: If you hold a raw egg in the palm of your hand, and then close your fingers and thumb around it, you can squeeze with all your might and not break the walls of the truly incredible, edible egg. Try it. Over a sink. And don't wear a ring or accidentally let the egg roll up onto the insides of your knuckles before squeezing.